Well summer is still here folks, what many call the "dog-days" and I know many of you're still reeling from the unforgiving summer heat, but being in San Diego, we've staved off most of the nasty awful tropical moisture exported to us from our friends in the south until just this week. But now that August has peeked its head in the door, with a bit of dragons breath, it's high-time to think about wines to help you keep your cool in the last official month of summer, although here in San Diego our summer tends to stretch far into November. So what do I have on deck for today's review, two entirely different bottles of Pinot Grigio, both sent to me as samples, both from Italy and both come from easily recognized producers. The first one in the review spotlight is from the folks at Attems. This wine rests nicely in glass, sporting a light hay-colored core. I'd drink this wine at cool 57 degrees to keep it from becoming nearly monolithic at warmer temps. After the first slurp, crisp and edgy minerality, wet stone, a touch of ripe apple and fresh almonds, await the thirsty vino-sapiens who dig this style of Pinot Grigio. Many find this style of wine to be "An innocuous, uninteresting wine, that lends itself for easy pairings with pasta, chicken and fish" ~ Lettie Teague and I would have to say in the case of this wine, I too must concur with that statement. Ms. Teague does however go onto defend this often maligned grape variety rather nicely, so feel free to click over to this article to get the rest of the story. 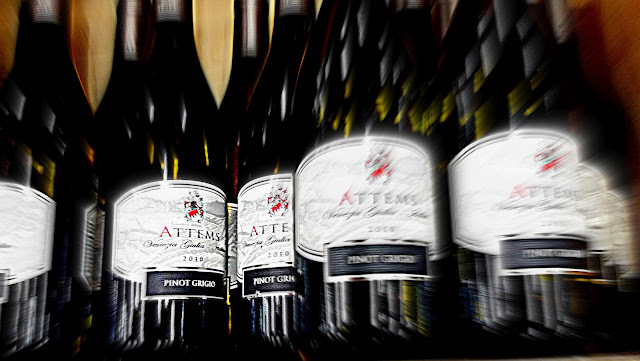 Regarding my impressions of the Attems Pinot Grigio, [this is my second sample] it's a well made wine, comes under cork, with no apparent flaws. It's an high acid wine, thin yet very delicate white wine. It does surprisingly sell quite well and is very similar in style to what I believe is another over-priced Pinot Grigio, Santa Margarita. A wine that ironically even most in folks in Italy don't like, [or so I've heard] but for some reason these wines have become nearly "cult" faves for many die-hard fans here in the U.S. proving that this wine is obviously floating someones boat. Especially, on many restaurants wine lists where wines like this will fetch a pretty-price [$50] and retails for about $20 in most Costco locations and maybe higher elsewhere. Again not a wine made in a style that's appealing to me, but one that folks in the Anti-flavor league would find very interesting. I scored this wine 86 points, good but not compelling enough for me to part with $20. For folks not familiar with Pinot Grigio, [aka, Pinot Gris] it’s a white wine grape variety of the species known as Vitis vinifera [aka, the wine bearing grape]. In wondering how in the world this grape came into being in the first place, many believe it’s a “mutant” clone of the Pinot Noir grape. Now this may come as a shock to you, but it’s a grape which normally has a grayish-blue, pink or some cases leaning toward light yellow fruit. If you want to learn more about this grape and its many different styles, please check out a piece I wrote "To Gris or not to Grigio" where I generalize just a bit, on the differences please feel free to click here. 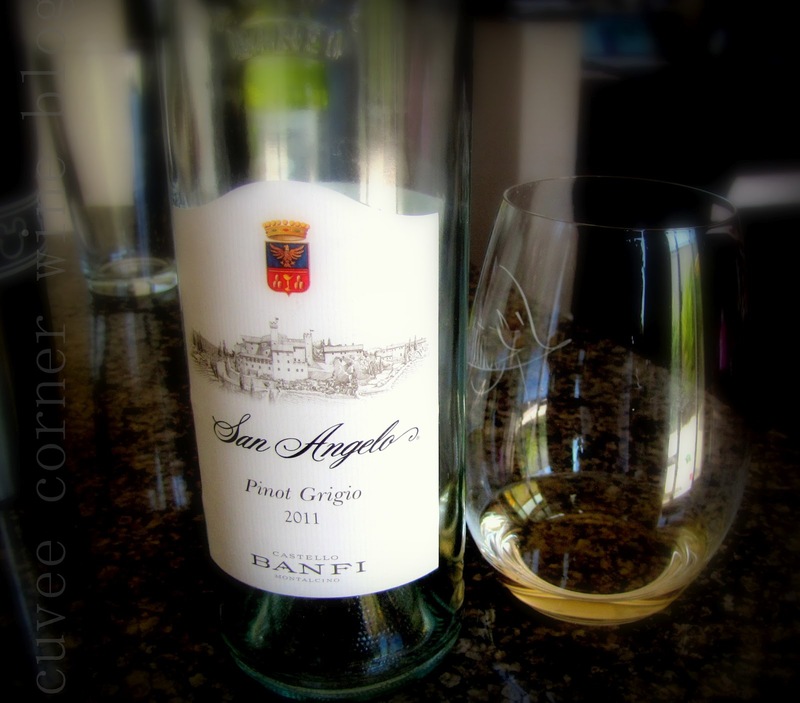 The next wine in today’s Summer White Wine Spotlight, a tasty wine from the great folks at Banfi, the 2010 San Angelo Pinot Grigio. A mouth watering example in my book, about how utterly tasty a Pinot Grigio can be, especially on a warm summer evening, it's quite refreshing. After pouring it my glass and allowing it to warm a bit, I found it to have a pale straw colored core with greenish hues reaching out toward a watery rim. The nose is big, bright and beaming with tropical fruit and flowery aromas, just delightful. After taking a big slurp of this lightly chilled Pinot Grigio, I found it brimming with green apple and tropical fruit flavors, a wine which nicely quenched my thirst, the low-hanging fruit is plumbed with firm acidity, white flowers and citrus give it nice overall balance. Are you wondering, what’s my score for this wine? I gave it 90 thirst quenching points, a great wine to have while sitting pool-side with the family or friends. This wines pairs harmoniously with many food choices [like Sushi] and easy on the wallet at $12.95. So honestly what are you waiting for; pick up those keys and head down to your favorite wine store to score a few bottles, you can thank me later, until next times cheers everyone!